When the district administration's decongestion drive near the Golden Temple failed to bring desired results, the Amritsar Municipal Corporation today kicked off an anti-encroachment drive to free footpaths, starting from Fountain Chowk point till the shrine, of obstructions and illegal structures. Even as the closure notices, served upon some major food joints for having unhygienic conditions in their kitchens, expired at 5 pm today, the Amritsar Municipal Corporation sternly warned the respective managements to adhere to norms while preparing and serving food to customers. Taking note of irregularities and shortage of LPG cylinders in the city, the District Food and Supplies Department conducted raids on various gas agencies. Dr Rakesh Kumar Singla, District Food and Supplies Controller, said the raids were conducted on Sandeep Gas, Nirmal Gas, Ganpati Gas, Amritsar Gas, Arora Gas, Desh Bhagat Gas, Gurwinder Gas and Graduate Gas agencies. He said notices would be served on these agencies after officials compile the various irregularities noticed during the raids. As new governments would be formed in Punjab and Uttar Pradesh, people of two states should pressurise the governments on implementation of stronger Lokayuktas in respective states, said Kiran Bedi, former IPS officer and a core team member of India Against Corruption (IAC). As many as 6,226 cases were disposed of during the mega lok adalat held jointly by the District Legal Services Authority of Amritsar and Taran Tarn at districts court complex here today. A rose is a rose is a rose said Gertrude Stein and that's what the residents experienced on Saturday at Company Bagh. City's one and only garden that is home to the best of nature's beauty, had another show put up for the first time. 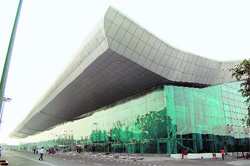 Unavailability of transport facility connecting Sri Guru Ramdas Ji International Airport with the holy city has led to great inconvenience to passengers, their relatives as well as the employees of various airlines and government agencies. The main commercial complexes of the holy city namely, Nehru shopping complex at Lawrence Road, the district shopping complex at Ranjit Avenue and Dharam Singh market near the Golden Temple are nightmares for shoppers as well as the shopkeepers. Chief Khalsa Diwan-run Sri Guru Harkrishan Senior Secondary Public School, GT Road; and DAV International School were conferred with ‘International School Award’ at the Fourth Edu Convex, organised by University of Cambridge and Planet Edu, in New Delhi recently. The Khalsa College for Women will host an University Grants Commision-sponsored national seminar on ‘Parvasi Hindi Sahitya Aur Sahityakar’ from February 27. Nitin Rajan Kesar, a trader from the city has demanded action against a police officer for not arresting an official of the excise department who has been declared a proclaimed offender by a local court. In his complaint to Baljit Singh Randhawa, ADCP - Special, Kesar has alleged that the SHO concerned was deliberately not arresting the accused. Instead, he alleged, the police official was helping the accused to evade arrest. The police arrested three persons for possessing an illegal arm procured from Uttarakhand. Earlier, the administration on its part has notified the area as a no-vehicle zone. Amritsar Tribune has carried out a massive campaign to highlight a large number of encroachments on footpaths by small-time traders and makeshift vendors. Encroachments proved to be a major bottleneck in pedestrians' movement. Accompanied by a large posse of police to deal with any resistance from encroachers, the AMC authorities confiscated goods displayed outside the shops and also brought down temporary sheds constructed by shopkeepers. 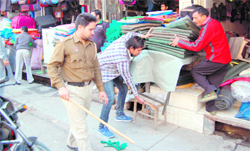 Estate Officer Vishal Wadhawan said the anti-encroachment drive would continue and the offenders would face stern penalty if they again encroach upon the footpaths. "This move was initiated to give some relief to pilgrims. The encroachments had left devotees in particular and public in general a harried lot," he said. Residents felt that many issues, which have been overlooked for a long time, call for an immediate attention to make this drive fruitful in the longer run. They said three public toilets on the way to the Golden Temple stink badly. Then there is no check on encroachers who set up small shops and kiosks on footpath on Sundays and escape attention of the authorities. Residents complained that these vendors throw waste on the road itself. And with no MC sanitary staff on duty on Sundays, the waste remains piled up till Monday. The rehri market, selling chaat and snacks, on the pavements at Jalleibi chowk, leaves behind refuse. Naresh Johar, a resident, hailed the anti-encroachment drive of the MC and also advocated raising a boundary wall inside the Dharam Singh Market to curb encroachments by shopkeepers. A pilgrim, Harcharan Singh suggested that the entrance to Dharam Singh Market be changed from the main road to Moti Bazaar side. Another suggestion put forth by residents was to streamline the chaos outside banks located in the vicinity of the Golden Temple. "Employees of these banks should be instructed to park their vehicles in the designated parking lot of the MC situated on the entrance of Hall Gate," said Gurcharan Singh, a resident. Even as the closure notices, served upon some major food joints for having unhygienic conditions in their kitchens, expired at 5 pm today, the Amritsar Municipal Corporation (AMC) sternly warned the respective managements to adhere to norms while preparing and serving food to customers. Health officer Dr Yogesh Arora said restaurants, hotels or any kind of eating joint not adhering to the stipulated hygiene or fire safety norms may face cancellation of their licences. The AMC officials had temporarily suspended the permit of some major eating joints, including century-old Kesar Da Dhaba, Crystal and famous Beera Chicken corner for not following norms stipulated under the Food Safety Act. "They can only re-open their joints subject to the condition that they maintain the requisite standards over there. Our team can conduct raid anytime. Those found defaulters would face permanent cancellation of their licences," he said. Meanwhile, some residents believed that the impact of the raids would last only till the new government comes into being. "It is a commendable step on the part of the MC to conduct such a move, but it could be done only because there was no political intervention at this juncture. Post March 6, everything would come to naught," said Jagdish Singh, a resident. Taking note of irregularities and shortage of LPG cylinders in the city, the District Food and Supplies Department conducted raids on various gas agencies. Dr Rakesh Kumar Singla, District Food and Supplies Controller, said the raids were conducted on Sandeep Gas, Nirmal Gas, Ganpati Gas, Amritsar Gas, Arora Gas, Desh Bhagat Gas, Gurwinder Gas and Graduate Gas agencies. He said notices would be served on these agencies after officials compile the various irregularities noticed during the raids. He said it was found that majority of the delivery boys neither wore dresses nor had identity cards pinned on their shirts. He said many delivery boys were also found to be overcharging for LPG cylinders. Singla said 11 domestic LPG cylinders were recovered from the possession of one Amarjit Singh of Mehta who was black marketing at higher prices. Importantly, residents of several localities in the city had been complaining of shortage of domestic LPG cylinders for the past sometime. 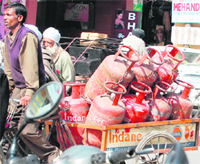 Shortage of LPG gas cylinders and black marketing has left residents high and dry. Consumers were made to wait for at least 15-20 days to get the refill. In the black market, a domestic LPG cylinder sells between Rs 550 and above. Speaking at the volunteer meeting at Virsa Vihar here today, she said the present Lokayuktas in the two states are very weak and these work under the respective governments of the states as they were appointed by the Chief Ministers. "These Lokayuktas are needed to be strong and out of the ambit of governments, so that they could work independently," she said adding that the Lokayuktas in the states should be formed on the lines of Uttarakhand where it works independently. On the Jan Lokpal Bill, she said the Team Anna has sought to keep the CBI out of the realm of the governments. She called upon the volunteers of the IAC to reach out to every citizen and make them aware about the bill. She said the IAC would also make the public aware on the right to reject candidates during polls. The session was held under the jurisdiction of District and Sessions Judge HS Madan. Over 8,400 cases were taken up and a compensation of Rs 19 crore was disbursed to residents in over 6,000 cases pertaining to family disputes, civil and criminal, landlord-tenant disputes etc. The District and Sessions Judge, HS Madan, said such lok adalats play a vital role in saving precious time of the court as well as settling the disputes amicably. “Most of these cases linger on for want of dates in courts. Here the complainants get instant relief without going through any hassle,” he said. Bringing fresh spring blossoms on a winter afternoon, the flower and baby show organised by Mission Aghaaz in collaboration with various organisations from the city had colours spread all around. With variety of flowers on display, the garden came alive with fresh spring breeze. From one reason to cherish, that's nature to another - people. Happiness is infectious, and the flower show had one floating everywhere. Families of young, old; youngsters in their Saturday best attire, love-birds holding hands…the spirit of nature came alive. The first day of the first such show saw good footfall and that was enough a proof for the organisers to call it a success. "The two-day show is aimed at promoting green culture, supporting nature and trying to revive the natural environment of Company Bagh. We have been floating the idea for quite sometime and with the support from various NGOs and professional organisations we could arrange this one of a kind event in Amritsar," said Deepak Babbar, executive director, Mission Aghaaz. Moving around the flower beds of bright-coloured Cadilla, Pansies and dahlia in full-bloom, the visitors looked quite fascinated with nature's beauty. "That was the point. When people are aware of what they are missing, only then will they start take notice. If we bring them closer to nature through such initiatives then they will value it as well," said Babbar. Beauty in its most natural form was appreciated by some onlookers as well. Chetan Chibber, a school teacher from the city said, "It is sad that we run after artificial beauty and forget that there is nothing more beautiful than nature at its best. It's good to know that Amritsar too enjoys nature and I hope this becomes a regular feature at Company Bagh." Sandeep Kaur, a student who had come all the way from Jalandhar to visit her friends in city, too enjoyed her outing. "I am enjoying the show. I have never seen such pretty flowers before." Foreign visitors could be seen enjoying the beauty too. Hisashi and Yujishimamura, tourists from Japan, said, "It's so vibrant here. This is for the first time that we are visiting the holy city and what a way to begin our trip." As for the cause behind the show, Mission Aghaaz plans to adopt trees at Company Bagh and maintain them. The baby show is scheduled for day two and will have a competition amongst the city kids for their individual flower titles. Ramanjit Singh Sidhu, a passenger, said his family could not pay obeisance at the Golden Temple as no direct bus service was available from the airport. The only buses available were the ones run by the SGPC but the timing of the same clashed with the flight timings. “My family had come from Jalandhar and before boarding a flight to Delhi wanted to pay obeisance at the Golden Temple. However, due to the difference between the timings of the flight and the bus, they could not avail the free facility being extended by the SGPC. He said there was no option but to call for the much more expensive cab service. An employee of the meteorological department at the airport said he had come from outside the city and had to board a long-route bus in the absence of any other facility to reach office in the airport. The bus dropped him at the entrance of the airport and he had to walk over one km stretch in the absence of any transportation facility at the airport. Passengers with bags and baggage have no alternative but to rely on the costly taxi service. Airport director Sunil Dutt said mass transport facility will only be available at the airport if the city bus service became functional here. He said to provide transportation to the passengers alighting from the national and international flights, mega radio cab service was started in September 2010. Municipal Corporation, Commissioner, Dharam Pal Gupta, assured that the connectivity of the city with the airport will be a priority once the city bus service becomes operational. He said 150 buses will be started under the city bus service, which is expected to start within the next three months. Rated as the most advanced shopping plazas of the city in the 1990s, the Nehru shopping complex was conceptualised with a provision of over 350 shops. A majority of these shops here are not unoccupied yet. With no arrangement of lights, the entire complex wears a dreadful look at the time of sun set. Despite being amply spacious and attached with multi-storey parking facility, the management of the Amritsar Improvement Trust (AIT) has failed to sell the shops here because of utter disregard for basic amenities here. Since no regular parking mechanism is followed here, commuters hesitate to park their vehicles in the designated parking lots and instead park their vehicles alongside the road leading to traffic snarls. The situation was the same at Dharam Singh market complex. The place besides being located on the prime spot is the last on the wish list of traders because of poor maintenance as the entire complex is devoid of basic facilities like sanitation, drinking water or lights. People even avoid walking past this area because of the stench emanating from the toilets. Both Dharam Singh market and Nehru shopping complex offer a terrible view to customers as shopkeepers have haphazardly installed advertisement boards of various sizes on the external walls. Besides, private concerns, which were allotted contracts to install hoardings in lieu of maintenance of the complex, have installed poles for the hoardings at every possible vantage space for money but have not fulfilled the condition of the contract to maintain hygiene here. Similarly, the district shopping complex at Ranjit Avenue is also a picture of neglect. Garbage is piling up behind the complex, besides broken roads, weeds and Congress grass. Huge pits here become invisible when rain water collects here and can also prove fatal for two-wheeler riders. The Improvement Trust authorities, which had conceptualied the complex, say Amritsar Municipal Corporation is responsible to maintain and clean the area while the AMC officials hold that it was the job of the AIT to execute and maintain the complex. The principal of Sri Guru Harkrishan School, Dr Dharam Veer Singh, received the prize. The conference focused on 21st century education, its challenges and opportunities. He said international award for academic excellence was in recognition of the work done by the school in the field of enhancing communication skills of the students. DAV International School principal Anjana Gupta said her school received the award for organising Cambridge University examinations and also for the excellent performance of its students in the same examination. She said her school students Jasmine Gill, Arshmeet Kaur, Jasrubab, Kamakshi Behl and Priya Gupta were rewarded with smart phones. Organised by the Department of Hindi, the two-day seminar will see participation of academicians, researchers and scholars, who will discuss writings and new trends in Hindi emerging in foreign countries, said Khalsa College principal Dr Sukhbir Kaur Mahal. She said Hindi writers serve the language in a big way in North America, Europe and Middle East. She added the national seminar would be an attempt to acknowledge and debate their writings and new developments taking place in Hindi. Dr Om Awasthi, former head of Hindi Department of Guru Nanak Dev University, Dr Neelam Saraf, head of department of Hindi in Jammu University, and Dr Chanchal Bala from Khalsa College for Women will present their papers. He said he had some financial dispute with the accused official of the Excise and Taxation Department. He said he had filed a case in the court of Varun Nagpal, Judicial Magistrate, First Class, and almost a year after the court declared her a proclaimed offender earlier this month as the accused failed to be present before the court even after repeated summons. Rajan said he made several rounds of the police station, but the SHO sent him back on one pretext or the other. He did not even bother about the orders of the court or his seniors. He has also urged the ADCP to take action against the SHO, arrest the PO and provide him justice. Randhawa said he had sought an explanation from the SHO in this regard. He said he had also directed him to arrest the accused immediately. Those arrested were identified as Amritpal Singh of Ranjit Avenue, Kisley Thakur of SG Enclave and Kulbir Singh of Nona village. Acting on a tip-off, the police set up a naka near Majith bypass and nabbed Amritpal Singh and Kisley Thakur when they were going towards the enclave. The police recovered a country-made pistol, two magazines and two cartridges from their possession. A case under relevant sections of the Arms Act has been registered at Sadar police station. Amritpal and Kulbir Singh were doing diploma in Animation at Ranjit Avenue. Amritpal said he wanted to buy a pistol and had told Kulbir Singh about it. They then procured the country-made pistol from an unidentified person from Khatima in Uttarakhand by spending Rs 25,000. Mahinder Singh, in charge, Majitha road police chowki, said Amritpal had given the arm to Kisley Thakur, who is a security supervisor at SG Enclave, to obtain a licence. Further investigations are on.